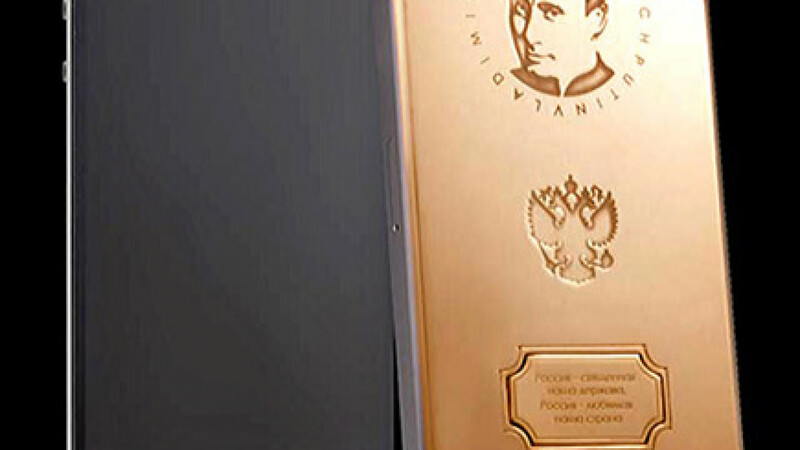 President Vladimir Putin's jewel-encrusted likeness can now be found gracing a limited run of gold-plated iPhones, available for purchase at the princely sum of 147,000 rubles ($4,340). Italian luxury brand Caviar's "Supremo Putin" iPhone 5S boasts an 18-karat gold exterior, the back of which features a portrait of Putin accompanied by the Russian coat of arms and the first lines of the national anthem. Caviar's description of the phone states that Putin has become the "symbol of a new generation." The company appeals to customers' sense of national pride by pitching the flamboyant device as "the best way to express patriotism." The new phone has propelled Putin to the ranks of Leonardo de Vinci, Mohammed Ali and Steve Jobs, whose faces have also been featured on Caviar's gold-plated iPhones. Putin's approval rating skyrocketed to record levels in the aftermath of Russia's annexation of Crimea and the president's face can now be found on a wide array of accessories, including mobile phone covers and T-shirts.